Time to boost up your body with vitamin A, C and beta carotene. 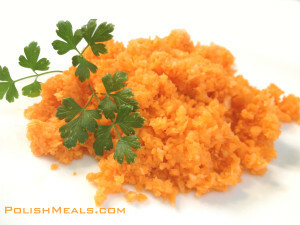 Sweet Carrot & Apple salad is a typical and popular polish side salad that is eaten all year round. 2. In a salad bowl combine sugar, lemon and oil. Add carrots and apples. 3. Serve or cover and refrigerate until ready to serve. Eating OIL with vegetables can aid nutrient absorption. Posted in: Salads, Side Dishes. Tags: apple, carrot, lemon juice, sugar.